The Billionty-Oneth Geek: A Trip to Ottawa 2009! A Trip to Ottawa 2009! Last year, my friends planned a trip to Ottawa in hopes of seeing the sights and sounds of the Winterlude Festival held every year. It worked out well because my pastor and his wife who lives there would have been out of town, and they had offered us their home for us to stay in for the duration of our trip. However, one thing we didn't plan on was mother nature's own intentions. There was a massive snowstorm that weekend, thus curbing our mini-vacation plans. I remember being sorely disappointed that we couldn't go, but it was not a total loss because I was buried in piles of work for my 4th year design project (that gives me an idea for a future post actually), so I headed back to Waterloo. The frozen Ottawa River and tons of people skating. Fast forward to 2009, it is February, and once again, it's time for the yearly festival in Ottawa. We (and by we, I mean my friend Vicky) had the trip all planned out and the weather looked to be pretty fantastic for the weekend. 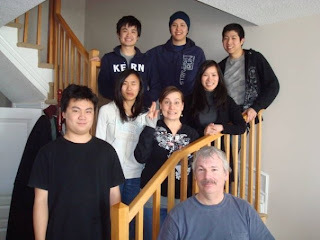 The girl's stayed at our friend Kalei's place, while us men stayed at Pastor James place. The drive was pretty good at slightly less than 5 hours, but it felt like less, attributed to the good company in the car. Once we arrived at James house (at about 1 am) we got right down to business and caught up with each other until almost 4 in the morning. It was good swapping stories and hearing about where we each were in life right now and where we want to go. 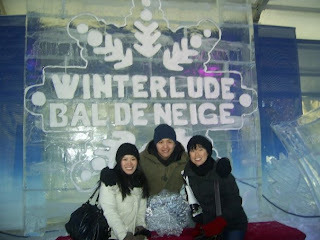 Vicky, me, and Kalei at an ice sculpture. 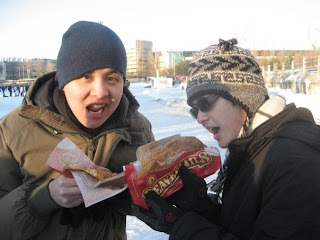 Me and Keith having Beaver Tails. Saturday was basically our festival day. Let me start off by saying that frigid weather and a tired state from having 3 hours of sleep are not a good combination. We visited the Byward Market and did a little shopping at the Rideau Centre before heading to the festival. At the festival we got to see all sorts of ice sculptures, we walked on the frozen river, and best of all, we ate delicious beaver tails. We ate dinner at a place called St. Hubert (think Swiss Chalet, with a mascot and logo that looks like Wing Machine). We were planning to go skiing/snowboarding after dinner, but I have no way how that could be possible... more than half of our group was nearly unconscious. Cold + Sleepy = Bad. Instead we headed to Kalei's house to chill, and attempted to watch Hot Fuzz, but I think half of us fell asleep. When us men got back to James' home, we talked to him for a while longer and afterwards we talked amongst ourselves, sharing whatever struggles or worries that were on our minds. It was a really good conversation and great subsequent prayers. On Sunday we visited The Met for church service in the morning (Another bad combination: sleeping at 3 am and waking up at 7 for church service). When I lived in Ottawa 2 years ago, The Met was operating out of this old theater that was retrofitted to be a church. The building was large but not as large as it is now. I think they are one (if not the largest) of the biggest church's in the city. They bought a new piece of land out in the subarbs and have erected a brand new building. It is quite a sight. The service itself was pretty alright. 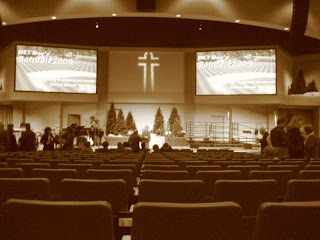 I think there's something with large church's like this that doesn't connect with me though. That said, the sermon spoken by Pastor Rick Reed was really good, focusing on Jesus' parables of the Kingdom of God and their paradoxes. We had a lunch at James house, with cake prepared by his wife Beate. The rest of the day was mostly recovering from our tired state by lounging around, and hearing stories. Most of us on the last day. I used a good portion of the afternoon to catch up with my friend and brother in Christ, Dayue. He's at the University of Waterloo right now (where I graduated) and it turned out that reading week was this week, so he was in Ottawa (his home). He's going through some rough times at school and I was just trying my best to encourage him and to not give up. I listened to all of his stories and experiences, and I swapped my own with him, so he could get a feel of what I went through (which was not terribly different from him, I did bad in my subjects at least in the first two years). It was really good to see him and connect with him again. I should also mention that this weekend was also my birthday and it was great to spend the whole time with my close friends. They really took care of me this weekend, and it was much, much more than I could possibly ask for. In the end, it was everything I wanted out of a short trip: spending time with my close friends, catching up with friends that I haven't for a while, and of course taking in the city. Yay for good company in the car! Those truckers were nice to have along as well. Sounds like a good weekend, Jeff. Nice to hear what's going on with you atm.